The PokerStars VIP Club is an exclusive player rewards system that provides qualified players with access to bonuses, prizes, tournaments and the VIP Store. The PokerStars player rewards system has set the industry standard for excellence and satisfaction since its inception. The VIP Club consistently rewards players and provides ample opportunities to earn extra money from the world’s leading online poker provider. PokerStars does NOT offer rakeback directly or through any third party. However, their VIP Club offers bonuses and cashback which work very similarly to rakeback. We describe this below. There are seven unique levels, and each is reached based on the number of earned VIP Player Points (VPPs). The first five levels are reached via monthly point totals, summarized below. The final two levels, Supernova and Supernova Elite, are reserved for the most dedicated players and offer tremendous player benefits. We will go into detail on each. 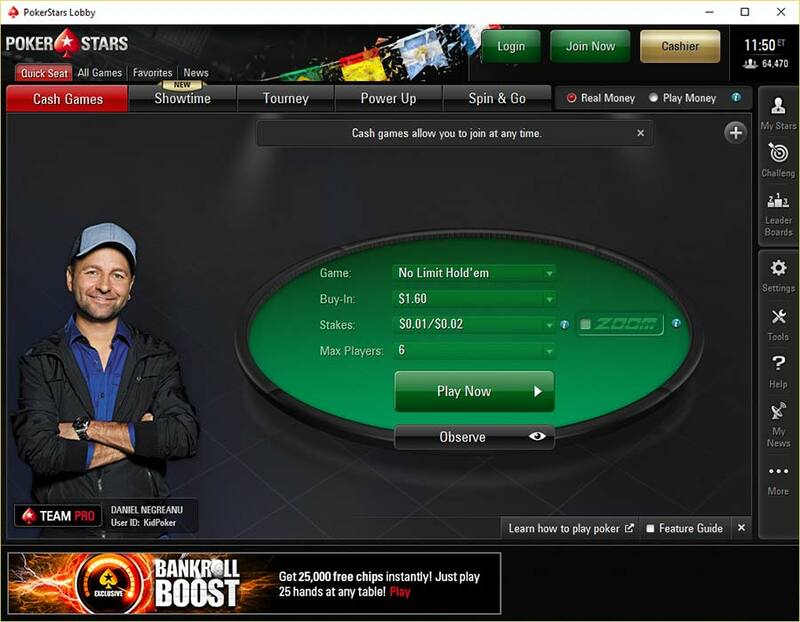 BronzeStar is the level that every player automatically achieves, as soon as they signup with PokerStars. This level includes access to the VIP Store, VIP Tournaments and up to $10 in Stellar Rewards annually. 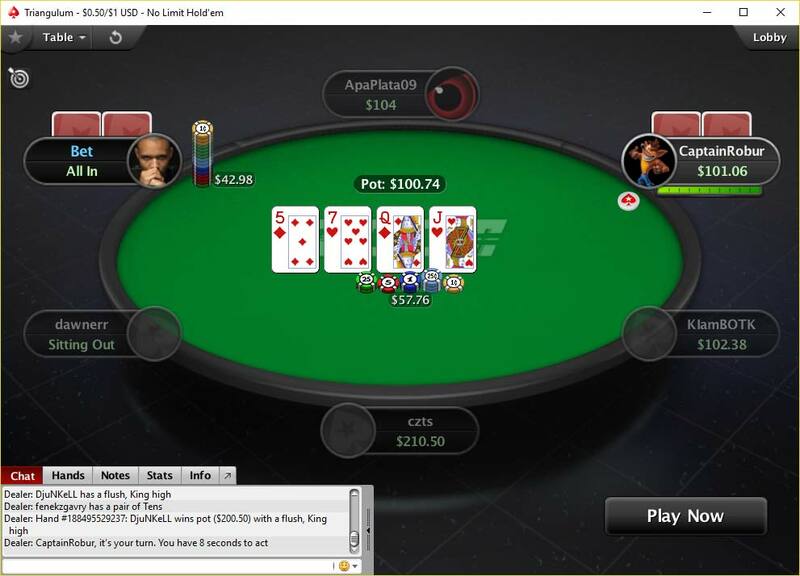 Players also have access to PokerStars’ award-winning support, enhanced security options, and VIP Reward Bonuses! ChromeStar is a new VIP level, meant to bridge the gap between BronzeStar and SilverStar. It gives expanded VIP rewards to even more players. ChromeStar requires 100 monthly VPPs. It increases available VIP Stellar awards by tenfold, $100 annually! Players get all the same great benefits of BronzeStar, with more access to high prize pool VIP tournaments like the Weekly $5K VIP Tournament. SilverStar requires 500 VPPs a month, but comes with greatly expanded benefits. This level has the first instance of a FPP multiplier, 1.5x in this case, which helps to earn rewards faster. 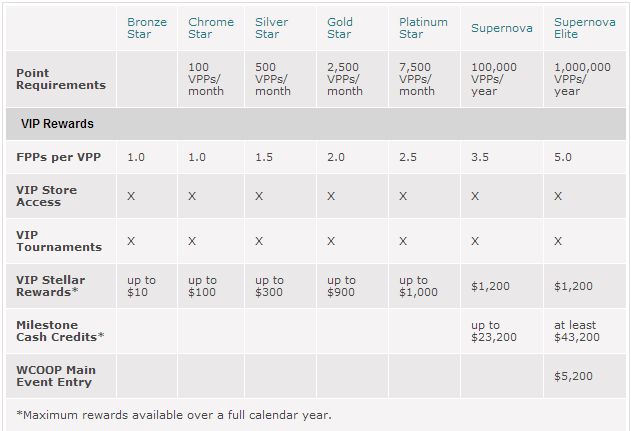 Annual stellar rewards increase to $300 annually, and VIP Rewards bonuses increase to $25 for every 2,250 FPPs cashed in. SilverStar’s also receive monthly VIP Club Statements and can play in satellites for the monthly $100K VIP Tournament! 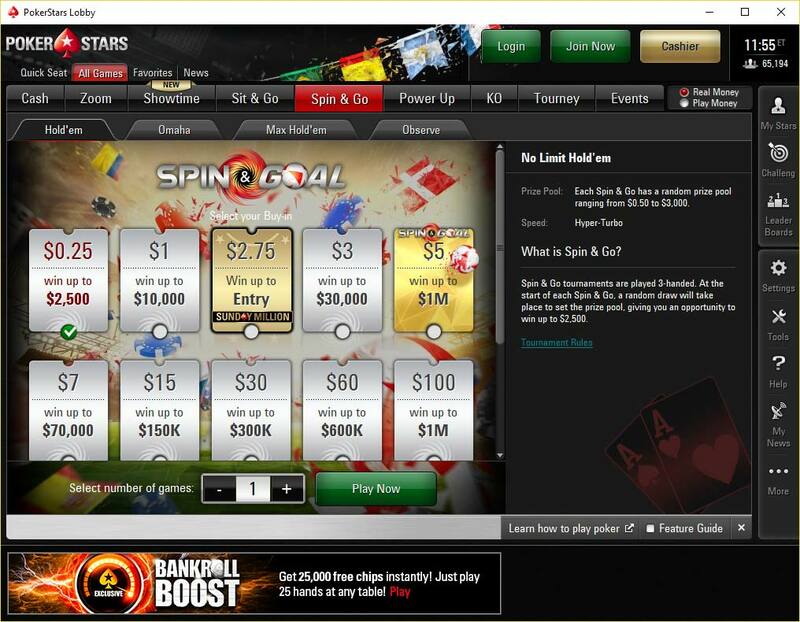 GoldStar requires a serious commitment to gaming, with 2,500 VPPs a month needed to maintain this level. Fortunately, it comes with great benefits. First up is the 2.0x FPP multiplier, which will help you rack up those FPPs and purchase many great items in the VIP Store. The Stellar Rewards have increased up to $900 potentially each year, and players can cash in FPPs at a rate of $75 for every 6,250 FPPs. 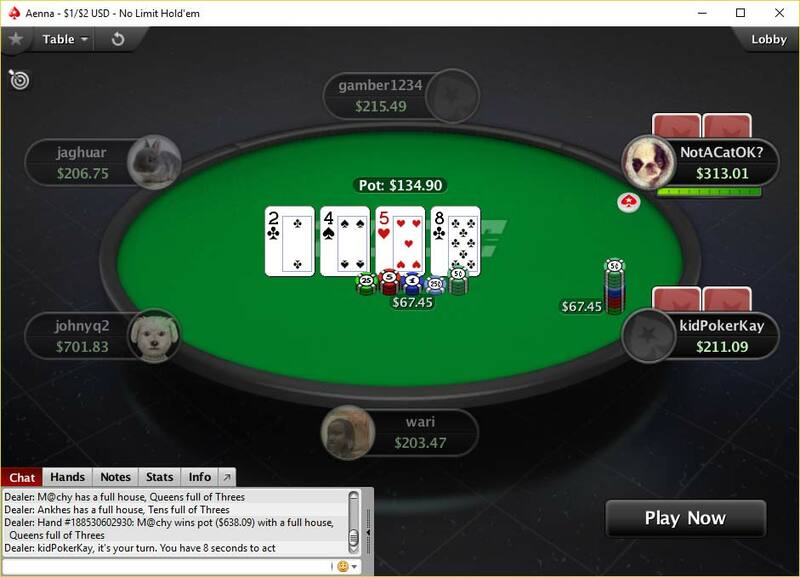 GoldStars can also play in the monthly $100K VIP tourney, and play in satellites for the quarterly $1 million VIP tourney! Next up is PlatinumStar, and the benefits are almost too many to count. With a 2.5x FPP multiplier and up to $1,000 in Stellar Rewards, PlatinumStars are making serious money. This level requires 7,500 VPPs a month, but also lets you play in the quarterly $1 million VIP tournament and enter weekly VIP satellites for the Sunday Million, the biggest weekly tournament in all of poker! If you’re a great player with skills truly out of this world, then you might want to shoot for the Supernova VIP level. This VIP level requires 100,000 VPPs in a year, no small feat. But with that 100,000 VPPs comes over $23,000 in Milestone Cash Credits, and special access reserved for the best of the best. Supernova level players can take advantage of the PokerStars concierge service, which allows them to spend their FPPs on things outside the VIP store! They also receive priority support and live event benefits! It truly is a great thing to be a Supernova! The Supernova Elite VIP level is the highest VIP status in all of poker. It has the most impressive requirements, and the greatest breadth of benefits. It requires 1 million VPPs a year, essentially averaging 83% of a Supernova every month. The Supernova Elite truly is elite, with over $40,000 in milestone bonuses, a $5,200 entry ticket to the WCOOP Main Event, discounts for major international tournaments, and a 5x multiplier for earning FPPs. The rewards are truly staggering, and it’s estimated that the process of achieving this level nets a player $100K in bonuses, credits and FPPs! VPPs are earned at the rate of 5.5 VPPs per $1 in tournament fees and 5.5 VPPs are rewarded to a cash game table per $1 in rake. From there the VPPs are divided to the players dependent on how much each player contributed to the pot. For example if 2 players played a hand with a pot of $100, the rake was $3m and no one else contributed to the pot, each player would earn 8.25 VPPs. FPPs, or Frequent Player Points, are the currency of the PokerStars VIP store. FPPs are used to purchase bonuses as well as other items desired from the store. FPPs are calculated by multiplying your VPPs earned by your FPP multiplier which is determined by your VIP level, ranging from 1x to 5x the amount of FPPs per VPP. VPPs are used to determine your VIP level monthly and annually. Your monthly VPP total resets every month, while yearly VPPs reset January 1. Frequent Player Points have monetary value and can therefore be used to purchase items in the VIP Store or enter tournaments. Each VPP you earn will also earn you at least one FPP, depending on your VIP level. The unique VIP level VPP requirements are summarized in a table below. They range from automatic benefits from BronzeStar to the mind-boggling requirements of the SuperNova Elite. The PokerStars VIP Rewards program is truly the best in the business. With benefits for literally every player, it’s tough to find fault with such a tremendous, player-friendly system. Check out a summary of the requirements and primary benefits of each rewards level below! -VIP Stellar Awards give players cash for their VPPs, with a total of 20 awards available and a potential $1,200 value. Stellar awards can be purchased easily from the VIP Store, but they must first be unlocked by earning a required amount of VPPs. This is very similar to a cash bonus system based on the number of points earned, except PokerStars simply gives you the cash as soon as you purchase the credit. -FPPs Multipliers are a great resource for players at higher VIP levels. Earning anywhere from 1.5x to 5x the amount of FPPs for every VPP earned makes playing more often a better value, as those FPPs can be cashed in for real money. These multipliers are the greatest, and most often overlooked, benefit of higher VIP levels, so be sure to see if you’re get the most out of your VIP level! -VIP Tournaments are plentiful and impressive, with freerolls starting at ChromeStar and many other low FPP buy-in tourneys to appeal to everyone. As you advance through the VIP levels, the available tournaments become more lucrative, like the $100K monthly freeroll for those at GoldStar and above! VIPs also have access to excellent satellites to major live events. -Milestone Cash Credits are available for the toughest grinders out there. For those who earn at least 200,000 VPPs in a year, they can purchase cash credits (for 1 FPP), starting at $2,600. Cumulatively, these credits are worth $136,800 if the 3 million VPP level is reached! -The VIP Store offers the most unique and exciting reward opportunities in online poker! Besides the thousands of dollars in cash available, players can purchase some of the most popular electronics, apparel and collectibles. 1,000 FPPs will get you a t-shirt, while 3.1 million FPPs will net you a Porsche! With the PokerStars Concierge service, there is virtually nothing that cannot be purchased through the VIP Store! Thorough the VIP Club, players can earn anywhere from 0% up to 78% PokerStars rakeback equivalent. This is done by using your earned FPPs to purchase cash bonuses, stellar rewards, and other items from the VIP Store. PokerStars really rewards their grinders! 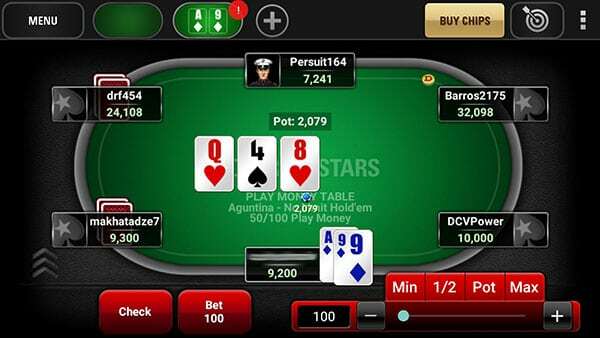 1) Visit PokerStars.com or download the PokerStars software. 2) Download, install & create a new account. 3) Make a real money deposit using the bonus code STARS600. 4) You will receive a bonus of your deposit amount, up to $600. 5) Clear the bonus by playing real money cash games or tournaments. See our PokerStars bonus clearing page for more details on earning your $600 bonus. With PokerStars, you can play with the best in the game and earn the most generous player rewards. Sign-up today and take advantage of these tremendous VIP Rewards!